The highest resolution image planned for this encounter will cover a 215-kilometer-wide (134-mile) bright feature provisionally named "Bazaruto Facula." (A facula is the name chosen to denote a bright spot on Titan.) 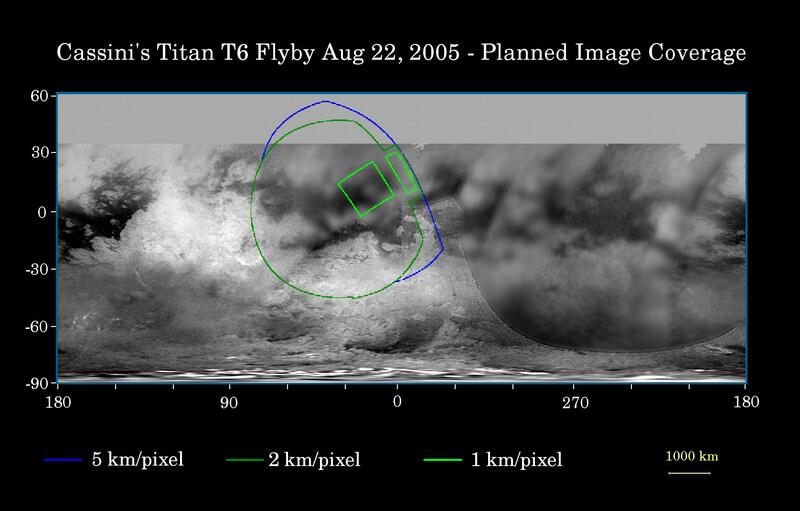 At the center of the facula is an 80-kilometer-wide (50-mile) crater (not yet named), seen by Cassini's radar experiment during a Titan flyby in February 2005 (see PIA07368 ). The imaging cameras and visual and infrared mapping spectrometer images taken in March and April 2005 also show this crater (see PIA06234 ).